Shortly after Canadian Confederation, in 1867, the No. 2 Troop and the Royal Guides Troop of the Montreal Cavalry Squadron were disbanded. This left No. 1 Troop as the sole militia cavalry unit in Montreal. In 1877, the Dominion government consolidated the remaining Quebec independent troops positioned along the U.S. border into two Cavalry regiments. The first of these was the 5th Dragoons (5th Provisional Regiment of Cavalry) which was the first cavalry regiment in Quebec. 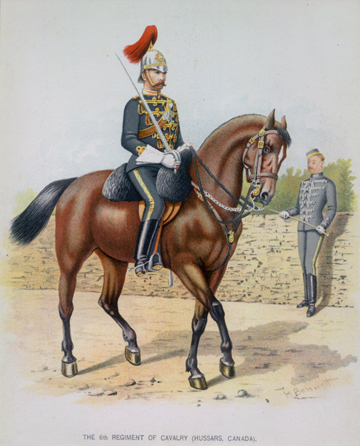 In 1879, the second regiment, the 6th Regiment of Cavalry (Hussars), was formed. This regiment incorporated the above-noted No.1 Troop. The 6th, as a Hussars regiment, adopted the uniform of the British 13th Hussars, a regiment which had seen service in Canada between1867-1869 and whose dress had become the de facto Hussars uniform in Canada.1 The 6th Canadian Cavalry Regiment (Hussars) wore a tunic of blue, single breasted and fastened with six gold olivets. On each side of the chest were six loops of gold chain lace with caps and drops. The facings were buff.2 Strangely, this new regiment chose to wear the plumed cavalry helmet, more usually associated with British yeomanry regiments, in lieu of the Hussars Busby. 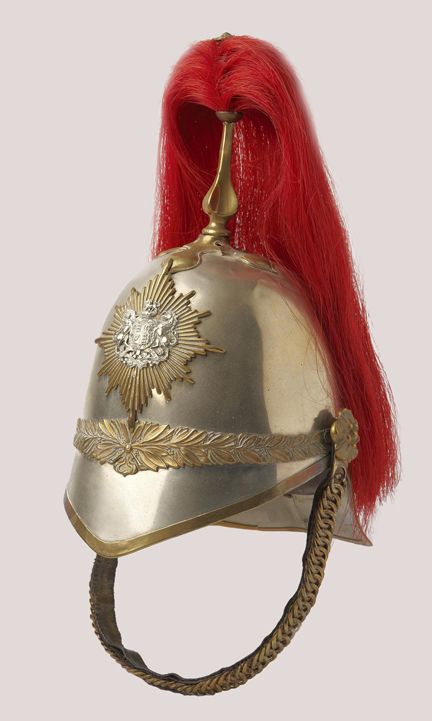 The helmet, of white metal construction rather than of the more typical brass, features a plain pattern, eight-pointed, diamond-cut, gilt star upon which is mounted a silver General List badge (this badge is the British coat of arms and is normally worn only by unattached officers). The plume is horsehair dyed red. The details of the uniform can be clearly seen in this print by Henry Richard S. Bunnett (1845-1910), a British artist who resided in Canada from 1885 to 1889. The 6th Canadian Cavalry Regiment (Hussars) is perpetuated, through the No.1 Troop, by the Montreal-based 17th Duke of York’s Royal Canadian Hussars, a unit of the Canadian Forces Reserves. 2. Regulations for the Dress of the Officers of the Army, Horse Guards, War Office, 17 May, 1883.